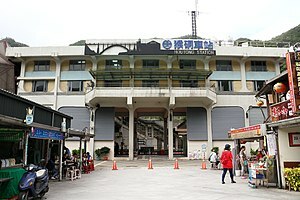 Houtong (Chinese: 猴硐車站; pinyin: Hóudòng Chēzhàn) is a railway station on the Taiwan Railways Administration Yilan line located in Ruifang District, New Taipei, Taiwan. Houtong once sat on top of Taiwan's largest coal mine, but now visitors come to see the numerous cats living in the town. In 1920, during Japanese rule, the station was established as Kōdō-eki (Japanese: 猴硐驛). In 1962, the name was modified (Chinese: 侯硐; Pe̍h-ōe-jī: Kâu-tōng), but returned to the original in 2013. In Taiwanese Hokkien, the station name is announced as Kau-tong-a (Chinese: 猴洞仔; Pe̍h-ōe-jī: Kâu-tōng-á). ^ "Volume of Passenger and Freight Traffic" (PDF). Taiwan Railway Administration. 2015. Retrieved 2015-05-08. Wikimedia Commons has media related to TRA Houtong Station. This Taiwanese rail-related article is a stub. You can help Wikipedia by expanding it. This page was last edited on 25 February 2019, at 00:44 (UTC).